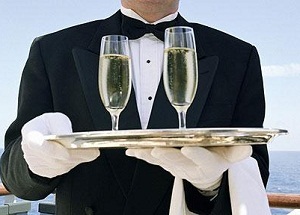 Cruise Ship Jobs - Assistant (Junior) Waiter, Waitress. - Actively participate in dining room entertainment according to established practices of the cruise line and alterations based on the specific itinerary - Pirates'Nights, Caribbean nights, Italian nights etc. $1800-2800 U.S. per month depending on the cruise line, size of ship and gratuities from passengers. Possibilities for promotion to Dining Waiter / Waitress position.